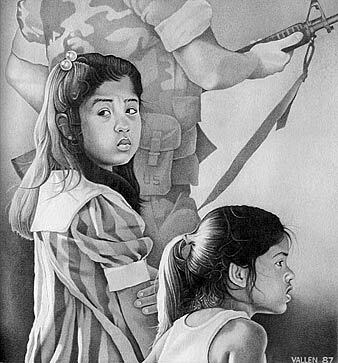 I exhibited a suite of four black and white drawings at Man’s Inhumanity to Man: Journey out of Darkness, an exhibition that took place at the Brand Library Art Gallery & Art Center in Glendale, California, from April to May, 2009. 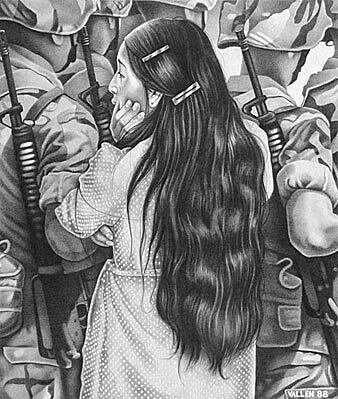 Forty four artists participated in the group show, which examined human rights violations that have occurred around the globe - the 1915 Armenian genocide, the Jewish Holocaust, repression in Central America, current atrocities in Darfur, and more. Azalea Iñiguez of Telemundo T52 - the Los Angeles affiliate of the second largest Spanish-language TV network in the U.S., interviewed me on her show - Cambiando el Mundo (Changing the World) for a segment about my works at the Brand exhibit. Originally broadcast on May 6, 2009, you can now watch a streaming video of the interview at the Telemundo website. 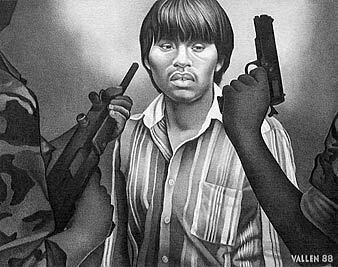 During the 1980s I created a number of artworks that depicted civilians caught up in the wars that swept the Central American nations of Nicaragua, Guatemala, and El Salvador. Hundreds of thousands of people were tortured, maimed or killed during that bloody decade, and many more escaped the carnage for safety and asylum in the United States. The very face of Los Angeles was changed by the enormous influx of war refugees. The four drawings I presented at the Brand Library Gallery represent just a small portion of my body of work from that period. Sometimes facts can be hidden or obscured for many decades, if they come to light at all. But no matter the circumstances, certain artists will always document situations ignored and left unseen by mainstream society - that in part is the power of art. I spoke at the Brand Gallery on Saturday, April 18, as part of an artist’s public forum, the roundtable including artists Poli Marichal, Arpine Shakhbandaryan, Sophia Gasparian, Lark, and Hessam Abrishami. Man’s Inhumanity to Man ran at the Brand Library Gallery, from April 4, 2009, to May 8, 2009. 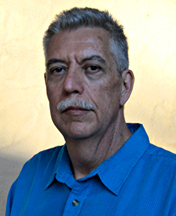 The gallery is located at 1601 West Mountain Street, Glendale, California 91201-1200. (Click here for a map) Hours: Tue/Thu 12 - 8 p.m.; Wed 12 - 6 p.m.; Fri/Sat 10 a.m. - 5 p.m.